all pulled together to make Albright's 152nd Commencement both memorable and peaceful. THE GRAY CLOUDS that hung over Albright's commencement exercises on May 22 were not the only concern for those attending. Crossing North 13th Street as they processed to Shirk Stadium, eager yet cautious graduates found themselves flanked by protesters. Reading police were in attendance, as they usually are, but this time they included a K-9 officer and his handler. Mounted Pennsylvania state policemen were on hand as well, standing guard on the sidewalk at the bottom of the steps leading to Exeter Street, two on either side, watching the students process from atop tall, muscular steeds. Two others were farther up North 13th, where other protesters had gathered earlier. Albright security checked bags and scanned people entering the stadium with metal detectors. A ticket—10 were issued per student— was necessary to gain admission. A bit later, as the commencement speaker began his presentation, a handful of graduates lifted their programs before their faces in a symbolic disengagement from his words and presence. It was not a typical graduation for Albright, which found itself briefly tossed about in the political storm over newly elected Pennsylvania Gov. Tom Corbett, a Republican who ran on the promise to bring the state's estimated $5 billion budget deficit under control. President Lex McMillan had invited Corbett to speak just weeks after he took office. Corbett accepted, but in early March he issued the proposed 2011-2012 state budget with draconian budget cuts for public education: 25 percent for primary and secondary schools and 50 percent for state and state-related universities—$1.5 billion overall. The ensuing backlash made Corbett a lightning rod for criticism and caught Albright in the middle. As the clamor over Corbett's budget spread across the state, voices of protest also rose among students at Albright. Several days before commencement, Sean Crossley '11, president of the senior class, explained what had happened among the students. "When the budget came out, there was disappointment and anger about him (the governor) coming to Albright," said Crossley, who is from Mount Penn but lived on campus. "Students were upset because it's our day, and we want the spotlight to be on our accomplishments." formally organized opposition by Albright students. "Individuals are doing this protest," she said, "not organizations." socially aware," Bruno said. "Especially as the senior class, we wanted to raise awareness." President McMillan invited seniors to a meeting in Memorial Chapel in April, he said, to hear their concerns and explain the College's point of view. Those present were not representative of the students as a whole, he said, in that many were education majors who would be most directly impacted by cuts to school budgets. Biehl pointed out that the meeting, which about 60 students attended, did not pan out as students had hoped. "The president said he would not change his mind," Biehl said. "The students wanted to have a conversation." President McMillan explained that negotiation was never the purpose of the meeting, although he did want to hear students' points of view. "There were two concerns," he said. "One was that we were endorsing political policy, blessing his proposed cuts. That is not the case." The College invites speakers from across the political spectrum, he said. They have included the previous governor, Ed Rendell, a Democrat, and Tom Ridge, the Republican who preceded Rendell. "The other concern was that the protesters will come and ruin our day," he added. But President McMillan had another concern that was fundamental to the College:"I asked the students, 'Do you really want to be associated with a college that will rescind an invitation to a speaker because he is controversial? How in the world can I look somebody in the eye if I do this and we are supposed to be a forum for open dialogue?'" The president told the students that he could not rescind the invitation to Corbett. "Students at the meeting were bitterly disappointed they could not make that happen," the president said. "They did not hear me on the core value issue." The president noted that he understands the students' objections. "There is a case to be made that the governor is not supportive of higher education." But he also saw the disagreement as an opportunity for the students to engage in civil discourse, and he was impressed by the students' civility. "We had a campus conversation in April," he said. "These are held on different subjects—race, for example. This year it was on civil discourse. "I had very much in my mind the generation of shouting heads on television, talking past each other, not with each other, and I felt it would be useful to have a conversation on this. "The impressive point was when you walked around the room and listened to the discussions in the small groups, about speech codes and whether they limit freedom of speech, about honesty vs. courtesy." Although he found himself at loggerheads with the group, discussion at the chapel reflected that conversation, said McMillan. "It was a model: It was passionate, heartfelt, they were upset, but there was no ad hominem attack on me." When he left after an hour and a half of explaining and answering questions, students applauded him for taking the time to meet with them. "As I left the meeting, it's interesting that one young man walked up to me and said, 'I think you ought to know that, if you uninvite the governor, my parents will boycott commencement.' "
Bruno said that students who were unhappy that Corbett was still to speak at commencement continued to discuss ways to show their dissatisfaction up until graduation day, including turning their chairs around or simply holding their programs or mortarboards in front of their faces. "We're trying to find ways to disengage from his speech," as Bruno put it. Christian S. Hamann, Ph.D., associate professor of chemistry and biochemistry and chair of the faculty, said Corbett had supporters as well as critics among students and faculty. While not speaking in an official capacity for the faculty, he said, "I personally think it's exciting to have a public figure come to commencement." As for the controversy, Hamann said, "Institutions of higher education regularly engage speakers whose positions are supported or not. It's part of a long and proud tradition that we're a venue for those voices." He did urge students to be prepared for any discussion. "We don't support half-baked arguments," he said. But like the threat from the gloomy sky, no major disruptions materialized. As Sean Crossley pointed out, Albright is a diverse place, and the students' reactions to the governor's presence varied. Drew Reich '11, a business management major from Fleetwood, Pa., said,"If we extended the invitation and he already committed to it, it wouldn't look good if either side were to back out." "It's wonderful for students to act on something they feel passionate about," said Amir Hardy '11 from Boothwyn, Pa. "The College did the right thing (in not rescinding the invitation), but I would have liked for the students to have more impact." Melonie Bailey '11, a theater and communications major from West Orange, N.J., and Diana Rivera, who was receiving a master's in elementary education, thought the governor should not have been there. "I think retracting the invitation would have been better," Bailey said. "I'm a teacher and don't agree with the protesters being here," Rivera said. "We've all worked so hard for this day." As commencement approached, protesters trickled in. Ironically, much of the signage reflected dissatisfaction with the fracking—a type of horizontal drilling to extract natural gas—going on in the Marcellus Shale formation across the northeastern tier of the state. A group called Berks Gastruths had about 30 people — about half the total number of protesters — at the corners of Exeter and North 13th streets, where the protesters were concentrated. "We're concerned about contamination," said Karen Feridun, Kutztown, the group's founder. Sean Kitchen, a science major from Kutztown University who will graduate in 2012, said that he was one of a half-dozen protesters from the school that were there to demonstrate against the budget cuts. "We had open dialogue (with Albright students) on Facebook, and the protests got mixed reviews," he said. "We emphasized that we're going to be respectful at their graduation." A small minority of the protesters was demonstrating over the economy and austerity measures. As the graduates descended the steps, smiles of relief flickered on more than a few faces as applause erupted from the protesters, who kept it up until the last graduate had passed. Some graduates took pictures of the protesters, some waved or applauded back. 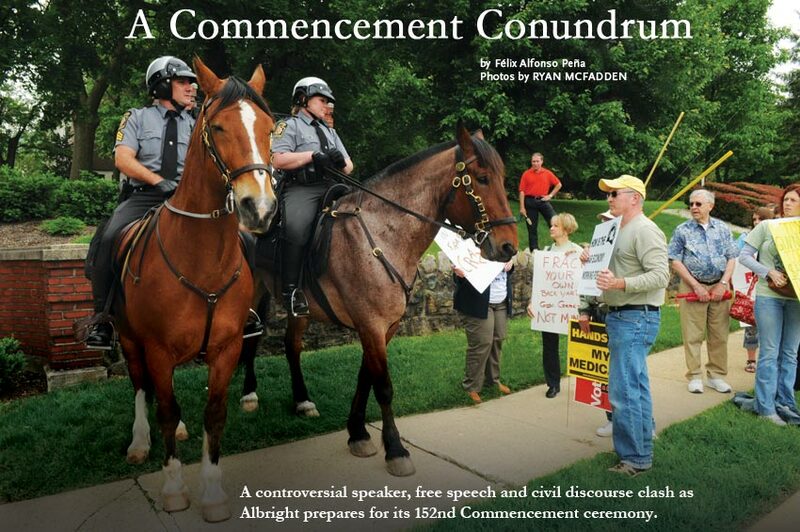 A few members of the faculty joined the protesters rather than participate in commencement. Among them was Alberto J. Cacicedo, Ph.D., chair of the English Department. "There were four who left the line, I think, although others wished to but were concerned because they don't have tenure," he said in a later interview. Citing the governor's proposed budget cuts as "inimical to education at all levels, not just higher," Cacicedo felt it was inappropriate for Corbett to address a college audience. "And I did not think it was appropriate for me to sit there and give tacit approval to his proposal." His choice would have been to retract the invitation to the governor, Cacicedo said. In his comments at the ceremony, President McMillan reprised his words of welcome to the class when they entered in 2007, when he described the College as "a membership that allows us to disagree and sometimes disagree passionately with one another but always with courtesy and civility." When Corbett delivered his address, five students covered their faces with their programs in symbolic protest, and a couple of beach balls bounced up into the air once or twice from the orderly rows of graduating students. In his address, the governor only alluded to any differences with students or others as he spoke about making difficult decisions. "Telling people no is the hardest part of the job," Corbett said. "Too much of the world thinks it's Christmas every day." He also criticized the increasing demonization of the opposition, as evidenced by popular broadcasters. "Ridicule has replaced reason," he said. To redress this imbalance, the governor urged the students to "have the courage of your convictions, and the courage to respect the convictions of others." The only disruption, a minor one, came when one young man in the stadium audience who was annoying those around him and displaying a sign with an obscene reference to the governor was escorted off the premises without further trouble. Tom McDaniels, Albright's chief of security, chalked it up to youthful impulsiveness and said the man was not arrested and no charges were filed. McDaniels acknowledged the cooperation of students, family, staff and the protesters as well as that of the law enforcement agencies and the administration. "The entire community pulled together," he noted. Many of the attendees, informally polled after commencement, remarked that Albright handled the situation very well, respecting rights of free speech and protecting the students' cherished moments to celebrate their accomplishment. Cacicedo characterized the security, with horses and state troopers, as "over the top … but given the nature of the 21st century, it's understandable." He also felt that the demonstration was so civil that "nothing got accomplished." Joseph Yarworth, Ph.D., chair of the education department, also said that the College did the right thing in not withdrawing the invitation, and that it handled the protests very well. He was also impressed with the governor's message. "He carried it off extremely well," Yarworth said. From the administration's point of view, Commencement 2011 was different, said President McMillan. "Unlike many others," he quipped, "we'll remember this one."